The company is bringing its artificial intelligence to a wide range of products. Google CEO Sundar Pichai kicked off today's keynote by emphasizing the company's shift in focus from "mobile first" to "AI first," saying it wants to create a personal Google for each user. The company demonstrated the fruit of its efforts earlier this year by giving us a taste of its AI "Assistant" in its Allo messaging app. But that wasn't enough, according to Google. Pichai said for Assistant to be truly helpful, it needs to be available universally, and so the company today showed how it plans to bring the helper to a wide range of products, including phones and items for your living room. Google hardware chief Rick Osterloh detailed how the company is working on devices that are built around Google Assistant, starting with the new Pixel phones. Google Assistant starts listening on the new Pixels when you hold down the home button (similar to how you'd activate Google Now before), or when you say the phrase "OK Google". In a demonstration on stage today, Google Assistant brought up (and rattled off) a list of events from the Hearst Greek Theatre in response to a query about what's happening there. Then, when asked to play music by The Lumineers, the Assistant brought up a YouTube video of the band's music and automatically started playback. You can also ask it to do things like show you pictures you took on a specific day. Indeed, Pichai said Google improved the quality of its artificial intelligence from 89.6 percent in 2014 to 93.9 percent today, and that this comes in particularly handy when it comes to recognizing pictures. 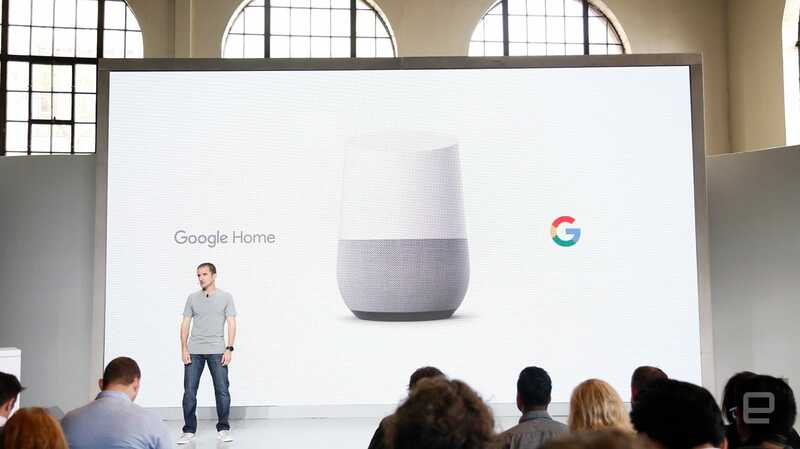 To bring the Assistant into our homes, the company is also building it into the Google Home smart speaker. You can use it to manage everyday tasks and play tracks from YouTube Music, as well as Spotify, Pandora and Google Play Music. In addition to the voice trigger, a touch panel at the device's top lets you activate Assistant. You can tell the speaker to turn the volume up or down, or play specific compilations. Plus, if you don't remember the exact title of a song, you can say something like, "OK Google, play that Shakira song from Zootopia," and Assistant will know you're looking for the song "Try Everything." That's all powered by Google's search engine, of course. Using Home, you can also get answers to various questions, such as what singer Adele's real (or full) name is. It'll understand follow-up questions too, as demonstrated onstage when the presenter asked Assistant "How many awards has she won?" and the AI understood that was in reference to Adele. Assistant also offers navigation and points of interest. In a separate demo today, Google showed how a query for "nearby camping stores" returned companies such as The North Face and REI in the area. Then, it provided traffic information as well as the time needed to get to each of those locations. At the start of the day, Assistant can also run down your list of upcoming activities and reminders, and does so somewhat colloquially. For instance, in a demo it said, "By the way, remember to cook dinner for your kids tonight," instead of something more stilted, like "You have a reminder for 'cook dinner for your kids." Assistant can also control your connected home appliances, and Google is partnering with Nest, IFTTT and a growing list of brands to integrate the service. Additionally, Chromecast (and Chromecast Audio) owners can use Home to play videos and songs, as well as pull up specific Google Photos on your TV (or speakers, in the case of audio tracks). Lead engineer for Assistant Scott Huffman said the company ultimately plans to launch an open developer platform that would allow anyone to create actions for Assistant. This will enable partners to come up with so-called Direct Actions for straightforward tasks such as turning on the lights. Another method is Conversation Actions, which creates a back-and-forth between you and Assistant to get you what you need, like an Uber ride. More information on Actions will be revealed in December, said Huffman. Eventually, though, the goal is to get Assistant working with every app and platform available. Google promises that Assistant will get better with time, but it already looks to be a solid amalgamation of all of the company's services that you can access from basically anywhere. That is, if you have a Pixel phone or Google Home speaker.